© 2012 by Ursula K. Le Guin. Originally published in Tin House. Reprinted by permission of the author. No one knows how many airlings there are, most likely not a great many, whatever a great many means. They inhabit the atmosphere, generally between a hundred and ten or twelve thousand feet above the ground, seldom clearly visible to human eyes, and leaving almost no trace of their presence. They swim in air as we do in water, but with far more ease, air being their native element. Slight motions of the whole body and the arms and legs move them gracefully through their three dimensions. We breathe air, but a very different element, the earth, gives us support. This might explain the apparent duality of human nature. Airlings, like fish or fetuses, are supported by what they breathe, and so to them flesh and spirit may be more nearly, more simply one. Airlings live off the warmth of the sun: They calorisynthesize, as plants photosynthesize. They eat heat. 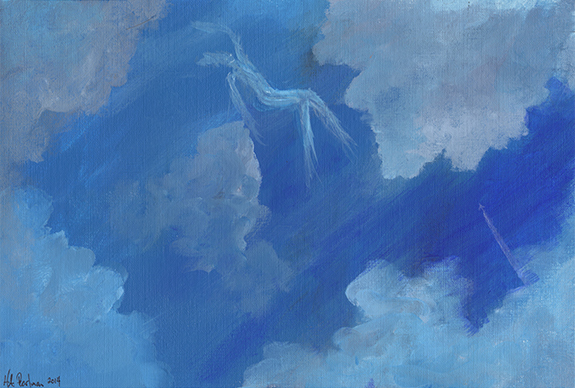 The highest, faintest stratocirrus clouds are believed to be their waste matter, their ethereal sewage, drifting upward to evaporate. The airlings’ small, slight, cool bodies are almost transparent. Only with old age do they begin to turn cloudy, verging on translucency. Infants are as clear as glass. If they ever did, the airlings no longer frequent the air near centers of human habitation. As we swarm thicker and thicker on the earth, the airlings have scattered ever higher into the atmosphere above the oceans, the largest deserts, tundras, and high mountain ranges. Many of them go south for the summer, to Antarctica, where in the endless sunlight above the blizzards they can fly as freely as they used to do. Our ever-increasing air traffic is evidently a problem or danger to them, but they avoid the routes and altitudes commonly used by airplanes; and they do not register on cameras or radar. Their voices are extremely soft, but their hearing is acute, and if the wind is not strong a pair of airlings can carry on a long conversation while flying a half-mile apart. Several human studies of their language or languages exist, and even some partial glossaries, but all of them are based on the most fragmentary evidence and, like the nineteenth-century treatises demonstrating that the languages of the North American Indians were derived from Welsh, consist mostly of wishful thinking. Airlings have no gender, or share a single gender, as you please. Young adults pair off on brief, warm, summer nights in the higher latitudes above the sea; the couples play in the air together, meeting, at the end of intricate and rapid configurations of flight, for a long, close kiss. Down in the tropics some seven months later, each one of the couple, attended closely by friends and relatives, may bear a child in mid-air. Careful and affectionate parents, the airlings carry their newborns out of every passing cloud or cloud-shadow to bathe and be nourished by the flooding heat of the sun. The babies can fly within a day or two. They sleep in the parent’s arms for a year or so. Even when it has learned to sleep on the wing, the child stays close to its parent for two or three years more. Then the little airling begins to make exploratory flights on its own, and before long the parent will guide it near a school, and soon will see it plunge into the throng without a backward look. In the school—dozens or hundreds of youngsters flying together—the children live, learn, and play together for ten years or more, till, nearing maturity, one by one they leave the group, going off on their own on world-encircling voyages, each alone in the vast ocean of the air. They meet and meet again, maintaining long-lasting relationships of consanguinity, friendship, and love, and carrying on their soft, far-ranging conversations; but airlings never stay together permanently, nor, once out of school, do they ever gather in large groups. Death comes to the airling as a sensation of ever-increasing warmth and lightness, as if they were afire, and gravity were letting go its hold. They begin to fly higher than they have ever flown before, seeking cold, rising into ever thinner air. One day, somewhere alone, almost in the stratosphere, the airling will suddenly combust and vanish in one slight, bright, all-consuming flare. Nothing of an airling ever falls to the ground. Airlings pay little heed to other creatures, but have been reported to tease hummingbirds, and sometimes they follow skylarks upward, imitating their song. In early spring and late autumn they often join the great migration routes, spending the long, dark, hungry nights nestled on the back of a wild goose or Arctic tern or sandhill crane, half asleep in the feathers between the powerful, slow-beating wings. The bird pays no attention to its almost invisible, almost weightless passenger. There is a movement to declare booklets an endangered species. I believe this is unnecessary; their adaptability will save them, as it did through the cataclysmic changes from clay to papyrus to vellum to paper in the West, and from scroll to bound book in both the Orient and Occident. The Romans, after all, knew them as volumenuli—scrollets. Perhaps the Babylonians had a word for them—cuneideformers? Actually, we can’t say with certainty that booklets read. All we know is that they respond to written or printed words, as words, in some way. Their most persistent and annoying behavior, interference with the order of letters and words, seldom seems meaningful, to us. I know a poet who leaves his notebook on shelves he believes to be particularly booklet-infested, hoping to find they have made wonderful or inspiring changes in his words, but I think him foolish. For one thing, they clearly prefer print to handwriting. Now that the only natural enemy of the booklet, the proof-reader, is a genuinely endangered species, the poet should simply print his poems and confidently expect to find typos, whether enlightening or not. There is no doubt that booklets multiplied in proportion as print replaced manuscript. Medieval copyists complained, of course, of the membranae pediculi (vellum lice) that transposed letters, altered words, and made nonsense out of whole passages in their work (particularly when the light was poor and they were sleepy). But only countless millions of booklets working, as they seem to do, in mysterious harmony of purpose, can account for the ever-increasing number of typos, transpositions, misspellings, and random garble we see in print these days. The absence of proof-readers can only explain part of it. Is booklet activity mere mischief, malice, as some believe? Do booklets so despise or envy us, or our books, to the point that they try to destroy them? Are they possibly trying to correct us—to point out, subtly, by making some of it meaningless, the inherent meaninglessness, the existential error, in all we write? Or are they quite indifferent to us and what we write except in using our symbols to transmit an entirely different order of meaning, opaque to us? Jopper’s Codex of Common Typos is a massive but unconvincing attempt to “translate” this supposed code or cipher. Whatever their purposes, I think it very likely that booklets are in fact quite indifferent to our purposes. Do they perceive us at all? To us they are invisible and imperceptible, except to people experiencing certain types of migraine aura. To me, this description brings to mind a phenomenon Mrs. Brown had never seen: a page of text on an early computer screen. The technology has improved, so that the text that I am typing right now into my computer, and that you may be reading on another computer, looks substantial, steady, clear, and stable. But it isn’t. The whole thing could vanish in a moment, or I could change every word in it again and again and leave no trace of what was there to begin with; if you don’t have a locked copy, so can you. I think the computer—which many thought would save us from the annoying tricks of booklets and render the species obsolete—is turning out to be their ideal ecological niche. We know they are adaptable. Probably they breed very frequently, like fruit flies. They must have undergone great change in the past twenty years in order to operate electronically as they did corporeally—for a booklet to become an ebooklet. But perhaps those changes lay in the direction their nature had always tended: just as, when he was needed, a kind of human being appeared who had never existed, because his capacity, his nature had never before been called upon, the computer nerd. Ebooklets, which many people carelessly refer to as “bugs,” totally avoid copiers, but they infested scanners at once and copiously. What the future may hold for them in the reproduction and dissemination of computer texts, who can say? Arbitrary alteration, omission and elimination, reversals and misplacement, introduced elements, and garbling—all these devices and strategies are infinitely easier to execute in electronic text. The instability for which Mrs. Brown sought the word in 1923 has been achieved. The pirating of incomplete and corrupted texts, the practice of “mashing” disparate and unrelated texts, the indifference to error, are good evidence of the essential instability of the electronic word. My guess is that ebooklets are eagerly abetting and feasting upon the activities of e-pirates, corporations dealing in information, paranoid governments, and human lazy-mindedness, towards the creation of a Universal Library in which information, misinformation, and disinformation are indistinguishable, a literature in which all texts are corrupt and there is no unaltered original by which to discover the nature and extent of the corruption. I wonder what ebooklets get out of this? Perhaps they were seeking, even as volumenulae, to destabilise the written word, returning it to the fleeting lability of unrecorded speech. Maybe the changelessness of writing, the lifeblood of historical cultures, is death to them, and they live and thrive on continual change toward disorder, entropic activity, the faster the better. If so, it appears that our increasing dependence on the computer has some drawbacks. Anybody who wants their grandchildren to know what Plato or Lao Tzu or Yeats or Saramago wrote had better keep a copy on paper, in Greek or Chinese or English or Portuguese, in a box treated with eucalyptus oil to discourage booklets and vetiver oil to discourage silverfish, with a plea to posterity to treat it as a valued inheritance, unique, irreplaceable, precious. Which of course it always was. Descriptions of the appearance and behavior of chthons are supported by legend, tradition, speculation, and passionate argument, but by little or no actual observation. We know very little about them. We know they are earth-dwellers, but do not even know how much the body of a chthon differs from the earth in which it lives. Is a chthon in fact just dirt, a little more active than dirt in general? Of course, in the larger sense this is true of ourselves, or any living thing. We are of the earth and its substance is our substance. Here the earthworm provides a useful paradigm. The worm lives in the dirt, moves through it, eats it, excretes it, is utterly and totally a citizen and creature of it, and yet isn’t it. The organization of the insentient minerals and organic refuse that compose dirt and their interaction in the living creature place the worm on a plane of being in which sensation and purposive activity are unmistakably more present than they are in dirt. Earthworms are not only sentient, they can learn and remember. They probably don’t think about a great many things, but they do think. And it is generally assumed that chthons, however earthy their substance, being by all reports very much larger and possibly more complex than earthworms and showing what many see as evidence of premeditated action, lead an existence on a higher plane of sensitivity and intelligence than worms—perhaps very much higher. But our favored metaphor of height to signify size, complexity, importance, etc., is out of place when used of creatures to whom depth may mean all that height means to us. It might well be more appropriate to speak, with awed respect, of how low a plane they inhabit. Certainly they are able to live deep down. How deep, we don’t know. The giant squid was known for a long, long time only through rumors and strange wounds on a whale’s side and improbable decaying fragments of an enormous corpse; and like giant squids, chthons live deep, stay down, and don’t come up. We’ve invaded the depths of the sea and photographed the giant squid, it isn’t just an old sailor’s tale, it’s a celebrity now like everybody else—it’s real, see? that’s a real picture, so the giant squid is real, the way it wasn’t until we took the picture. But there are no photographs of a chthon. Well, there are some. There are photographs of Nessie in Loch Ness, too. You can photograph anything you believe in. Our deepest mines barely enter the chthonic realm. Our deepest geoprobes may, but it is a very, very large realm, the underworld. There’s little hope of any physical object we could send down there meeting by chance with an inhabitant and recognising that it had met one. The camera of course is useless. A lens in the dark sees dark. In rock it sees rock. In magma it sees magma—very briefly, before it rejoins the magma. It is in fact much easier for us to send machines, cameras, telescopes, recording devices of all kinds, even people, ten million miles out into space than it is to send anything, let alone anyone, ten miles under foot. Going out is always easy, you just set off and go. Going in is never so easy, and going deep is quite another matter. The deepest hole we’ve made in the earth so far is only about a third to a fifth of the way through the outer crust. And at that depth, the heat is getting towards three times the boiling point of water, and the pressure crushes a steel beam like a wad of aluminum foil. Even if a seeing eye could exist in their dark realm, the great elementals of the underground may be assumed to be as elusive to normal human vision and perception as most other elementals. There may, however, have been sightings. Descriptions, vivid though incomplete and mythologized, of chthons, or of a chthon, exist in several parts of the world, including Japan and Indian California. There is a great earth snake, they said, that lives deep in the earth. When the snake moves, the earth moves beneath our feet. The Japanese and the Californians, being particularly familiar with earthquakes, might know what they were talking about. Most biogeologists now agree that the San Andreas Fault is a surface feature owing its existence to a creature about eight hundred miles long that resides several miles underneath it: a great earth snake, or chthon. It moves almost constantly. Its movements are occasionally abrupt and jerky, as if in pain or effort, and these attract human attention, sometimes to the point of panic. Most of the time the San Andreas chthon is busy smoothly and almost imperceptibly rearranging the relative positions of the Pacific and North American tectonic plates. It is pushing the area west of it towards the northwest at the rate of about an inch and a half a year, so that eventually Los Angeles will slide past San Francisco on its way to Alaska. Biogeologists certainly don’t consider this interesting phenomenon to be the goal of the rearrangement, but they can only speculate why the chthon wants to move the south coast of California out of California. Perhaps it is tired of the swarm of lesser chthons, its siblings or descendants, that crowd the depths almost everywhere in California in incredible numbers. Chthonic overpopulation gives rise to territorial rivalries and quarrels that cause endless faulting and instability, which is perhaps why the greatest chthon of them all has been driven to seek a quieter zone out under the northern Pacific Ocean. The great earth snake of the depths beneath the Japan Trench may be restless for the same reason. Or conversely, the three tectonic plates that are converging on those unsteady islands may be pushed by three different chthons intent upon meeting. To mate? To fight? To dance? Whatever their deep purpose, its achievement is likely to upset the tiny beings that run about on the skin of the planet far above them and consider themselves the crown of earthly existence. Whether chthons are or are not related to draks, the better-known inhabitants of volcanoes, is an open question. Some think draks are an entirely different species of elemental, citing the immense difference in their appearance and behavior. Others believe they are ancestrally the same. The original unifying theory held that both are born originally of magma. In this picture, the chthons, born deep inside the planet, migrate very slowly towards the outside, cooling, darkening, lithifying, and becoming more porous. As they near the surface, they die, their huge bodies returning to earth in earth. The draks, coming up much faster, take only a very labile form and retain the volatile and spectacular properties of superheated matter under pressure. They burst forth from Etna or Eyjafjallajökull and die in fiery explosions. A new unifying theory posits that chthons are born from fertile dust on the surface of the planet. Microscopically tiny, the wormlets begin at once to eat their way straight down. They devour their way steadily through dirt and rock, growing all the time. They never cease that downward, inward motion till they are miles under the surface. There in the underworld, particularly around the edges of tectonic plates, they move about easily and freely in the substance of the earth as earthworms do in dirt. At the next stage in their long lives, chthons head down deeper and ever deeper, boring toward the center without rest, tolerating the increasing heat and unimaginable pressure, till they come to the Great Discontinuity. There, transformed, they plunge straight down toward the molten iron core of Earth. And there they are reshaped, as the pupa is in the cocoon. They come forth as draks—slender, clawed, winged, with bodies of fire. They make their way upward rapidly, first through liquid rock, then through vents and fissures, seeking the magma chambers of the volcanoes. In them they may live for centuries, dancing endlessly with their kind in those incandescent halls. From them at last they will burst upward to the air, taking wing in a brief, terrible, and splendid mating flight. They are destroyed in that final, ecstatic escape from their body of earth, but from the dust of fertility that falls back to the ground from these great eruptions, the next generation is born. All this must remain, for now, speculation. The chthons are not invisible, but they live blind in utter darkness, and it is not certain that anybody has ever seen one. The draks are visible, but they live in white-hot lava, and only momentarily, blindingly, are they ever seen.